A simple attention-getter for use in restaurants and high-traffic locations. Small footprint highly visible. Tent cards are popular for restaurants, receptions and countertops. They have duplicate or unique images on each face and typically stand 6″ tall. The finished shape is a triangle with score at the centre line and the foot of each panel. The foot has a slit which allows the two sides to lock forming the triangle. Paper/Finish: 12pt card stock, gloss or matte. Standard sizes: 4″x6″, 5″x8″ and custom. 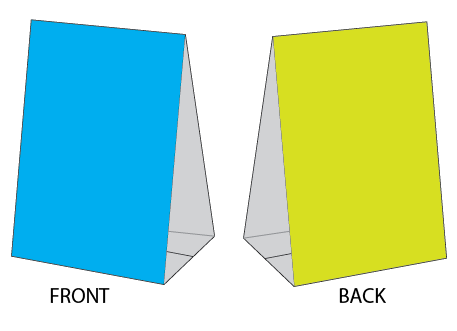 Size is measured based on the facing panels.